Your request an appointment has been received and processing. If you do not receive the email within a few minutes, please check your Junk E-mail folder just in case the email got delivered there instead of your inbox. We're providing alterations services such as bridal, prom & formal dress. Make Your Appointment & Get a Free Estimate. When you first receive your bridesmaid dress, it’s important to make sure it fits correctly. Sometimes it can be too long and may need shortening, the seam may need to be moved or the dress may need to be made bigger (let-out). If you are a flower girl, your dress may need to be made to order. Always do any bridesmaid dress alterations immediately or as soon as possible. Don’t wait until the last minute. There will be lots of rehearsals to get through and any delays will upset the bride. It is far better to get things right the first time. The only reasons you might have for delaying bridesmaid dress alterations are if you are sick or have lost weight before the wedding, in which case the seam might need to be moved. You don’t have to get the bridesmaid dress altered at the wedding dress boutique. We are a specialist, experienced alteration service who are more than capable of handling common alterations such as shortening, take-ins, let-outs, gaping neck lines and flower girl outfits. 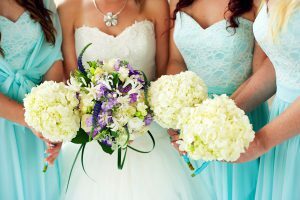 Bridesmaid dress alterations require care and precision, so choose an experienced seamstress who has worked on bridesmaid dresses before. 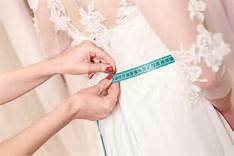 When you visit for your alteration, it is important to bring the shoes and bra you will be wearing at the wedding. The choice of bra is particularly important since it determines how much of the bridesmaid dress needs to be taken in. Shoes add height and may determine if the dress needs to be shortened. Always let us know when the wedding is and what your plans are, especially if there are planned rehearsals. Copyright © 2017 SewWeddingDress.com. All rights reserved.